Makeup and lashcare doesn’t have to come at the expense of your time and budget. Line eyes and boost lash growth at the same time with this amazing multi-tasking liquid eyeliner available in Classic Black and Dark Brown. Formulated with a lash growth peptide from Amplifeye® Lash & Brow Fortifier, the new Lash Densifying™ Liquid Eyeliner offers rich, pigmented color and lash boosting power that cannot be matched. Plus, it’s eyelash extensions safe so it won’t break down the adhesive that keeps your lash extensions in place. 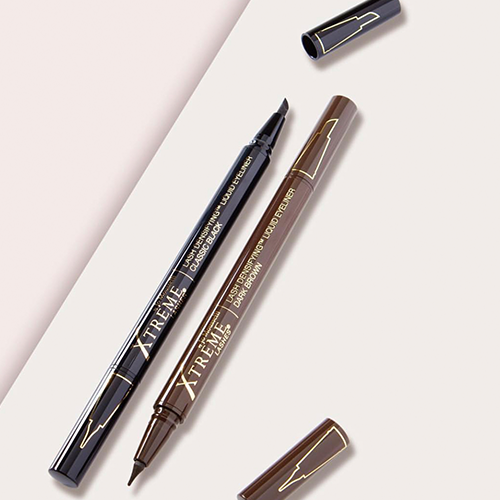 What’s great about this liquid eyeliner is that it’s not just for lining, but for correcting gaps and spots of missing lashes along the lash line as well. How? The double-sided tip helps to do just that. One side features the Precision Tip for correcting, dotting, and filling in gaps along the lash line for a denser look, and the Style Edge Tip for creating a winged liner with incredible ease. Give it a try today!